There were several early workhouses in Coventry. Holy Trinity parish had one 'in the priory' from as early as 1613, and, from 1726, another building called the Stonehouse in Well Street. St Michael's parish had a workhouse 'next Bridewell' in 1724, probably situated in a court, later known as Workhouse Yard, in Hill Street. In 1801, a local Act of Parliament "for Better Relief of Poor in Coventry" was passed. This established the Coventry Incorporation which, for the purposes of poor relief administration, united the parishes of Holy Trinity and St Michael (and also St John's, which was considered to be part of St Michael's for this purpose). The Act put poor relief into the hands of the "guardians of the poor" (£50 freeholders and £20 leaseholders) who elected a board of eighteen directors. The new directors sold off all the existing parish workhouses and bought the remains of the old Whitefriars house, a former monastery, which was converted into a workhouse. Inmates were provided with work in the form of textile manufacture. Between about 1812 and 1842, a commercial silk throwster was contracted to operate a silk mill in the workhouse. He paid the directors 1s. per week for each pauper he employed, of which pauper received 1d., plus 4d. per week from the contractor. The building was substantially enlarged during this period and by 1843 could accommodate more than 450 paupers. Its Local Act status made Coventry immune to most of the provisions of the 1834 Poor Law Amendment Act and it continued in operation until 1874 when it converted to a Poor Law Union. The Whitefriars workhouse remained in operation throughout the whole of this period. 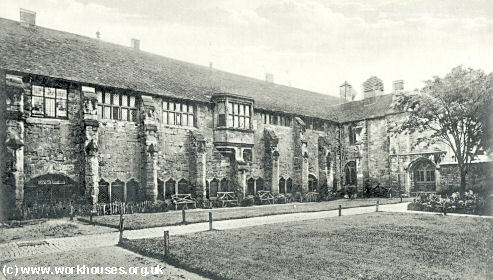 Coventry Whitefriars monastery quadrangle from the north-westst, c.1906. Inmates of the Whitefriars workhouse. © Coventry Libraries & Information Services. A report on the Coventry Incorporation and its workhouse was made in 1843 by Assistant Poor Law Commissioners Alfred Power and Robert Weale. They made a number of criticisms of the workhouse, especially of its silk mill which had been in operation for the previous thirty years. Although forming part of the workhouse premises, the mill was managed by a private contractor, a Mr Herbert, who paid the Guardians 1s. per head per week for the inmates employed there. The workers — 23 men, 17 women, 20 girls and 10 boys — were allowed to keep 1d. out of every 1s. earned by them, with a bonus of 2d. to 4d. from the contractor depending on each inmate's work. The Assistant Commissioners complained that the silk mill occupied one of the best rooms in the workhouse and produced a constant traffic of inmate messengers and goods between the workhouse and the city. Children, who were employed in the mill from the age of nine, worked there six days a week from 8am until 7pm with an hour's dinner break, and so were taken away from their reading. The Commissioners also regarded the workhouse as being too comfortable — beer was provided each day and smoking was allowed, with the over-50s being given a tobacco allowance. Inmates, with the exception of mothers with illegitimate children, were allowed out on Sundays to attend church but usually stayed out the whole day and often returned inebriated. 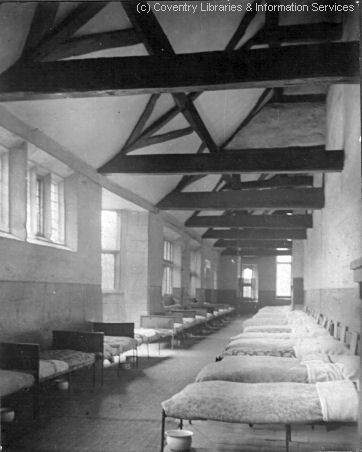 A dormitory in the Whitefriars workhouse. 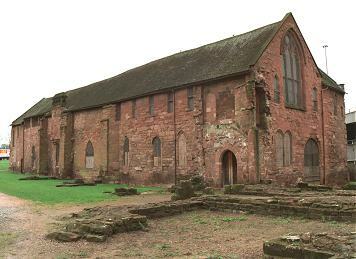 Coventry Whitefriars monastery building from the north-east, 2002. Coventry Gulson Road entrance from the south, 2002. Coventry 1889 infirmary from the west, 2002. Coventry 1889 foundation stone from the west, 2002. Coventry infirmary extension (left) and children's ward (right) from the south-east, 2002. In 1930, control of the workhouse passed to Coventry Corporation who adopted the eastern part of the site as Gulson Road Municipal Hospital, while the buildings to the south of the old monastery became a Salvation Army hostel. During the Second World War, the hospital became the main clearing station for war casualties after bombing destroyed much of the Coventry and Warwickshire Hospital. The site later became Gulson Hospital but has now been taken over by the University of Coventry. Only one section of the monastery buildings now survives, together with the 1889 infirmary and its later extension. By 1912, the Coventry Union was operating a umber of scattered homes in the city. Their locations included 66-68 Hill Street; Abbot's Lane; Whitley; 1a Argyll Street; and 699 Foleshill Road. The Coventry History Centre, The Herbert, Jordan Well, Coventry CV1 5QP. 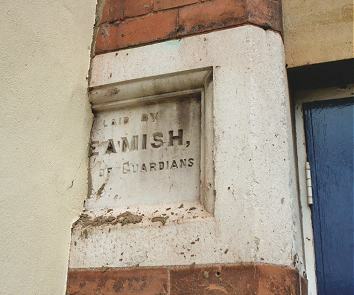 Holdings include: Guardians' minutes (1801-1930); Admissions and discharges (1853-1946, with gaps); Births (1875-1933); Deaths (1845-1943); Creed registers (1861-1943); Indoor relief lists (1851-1940); Register of inmates' property (1856-1929); etc. Hall, Rosemary (2008) The vanishing unemployed, hidden disabled, and embezzling master: researching Coventry Workhouse registers in The Local Historian (Vol 38, no. 2, May 2008), pp.111-121. 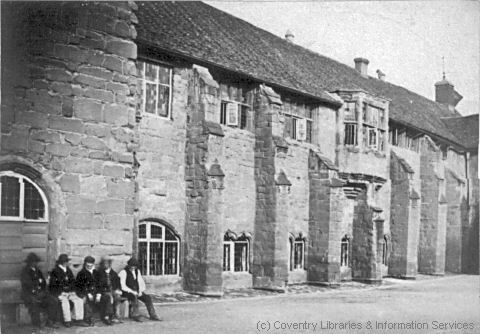 Archive pictures of Whitefriars workhouse are by kind permission of Coventry Libraries & Information Services.